Why I Have Not Been Riding and Posting as Much – Migraines. I just want to share something. We all have struggles. I applaud all of you who have come back from health problems like heart attacks and diabetes. There are other riders out there who may be less fortunate. I am a chronic migraine sufferer. What does that mean? For bicycling it means a lot. When temps go over 80F along with humidity over 80% you shouldn’t ride. Most rides in summer, water won’t cut it. You make sure you drink plenty of electrolytes, take magnesium, vitamin b, and probably a NSAID pill before you ride, as well as carry an emergency pill in your saddle bag, but one not powerful enough to knock you out, just get you home. This is when you can ride. Other days you just can’t ride. You plan to go on a ride and there is a change in the weather, or the pollen goes crazy, or worse yet you are in line at a supermarket and someone behind you has worn perfume or body spray that triggers a migraine. I missed a metric century ride this year when I came back from Colorado to sea level. The change in altitude put me in bed with a migraine for three days. Needless to say no riding. I was on a recent ride where I went out too soon after the headache pain was gone. But the headache pain is not the only thing, you suffer from the hangover from the medication, or other effects of the migraine such as nausea, blurred vision and fatigue. This is what impacted me on the ride as well as the heat and humidity. What came first, I don’t know, but 29 miles into about a 36 mile ride I bonked big time and my friends had to get a car to rescue me. As for medication and remedies. Don’t tell a migraine sufferer they should try this or that. Believe me we have heard it all. We also take preventatives. Last summer I was on such a high dose of one medication that I gained about 65 lbs, slept 12 hours at night and took a 2-3 hour nap in the afternoon. It was my lowest mileage year since I started riding again 9 years ago. I am on a different medication this year. I am slowly loosing weight and I have surpassed last year’s mileage. Anyway, I just thought I would share this. I still love to ride, when I can. Do You Wonder Why We Ride? I saw this on social media and thought I would copy it. I don’t know who the author is, but it is appropriate. I’m sorry for making you worry everytime I climbed onto my bike. For you worry this could be my last. I want you to know that if that is the case, I left doing what I really love to do. Please know that it is never my intention to make you worry. You may sometimes ask why I would risk my life “just for a ride”? To some people, no answer will be good enough. Others may say things like, “he’s careless or selfish”! And for the rest of you that are undecided, please take a minute to read on. “A ride” is our freedom away from a world turning evil, a nagging boy/girlfriend, a child that’s on our last nerve. “A ride” could have helped you stay another day at a job. “A ride” could have saved an argument, or kept a husband from saying something he regrets or a wife from burning the house down 🤷🏼‍♀️ “A ride” could be the only time a mom, dad, wife, husband, grandma, grandpa, girlfriend, boyfriend, sister, brother, aunt, uncle, friend, daughter or brother has during a day to catch his or her breath, to reenergize, to pray for strength to continue on with all the “job titles” a mother or father has in a day! Last but not least. I love it and everything about it. I love the long roads with the beautiful views! I love the excitement I feel everytime I push the pedals. I love the gas station conversations. I love the out of the blue races. I love the family that’s within the cycling community. I just love the ride! I will finish by saying THANK YOU! Thank you, for supporting me even though you’re not comfortable with it. Thank you, for the countless prayers. Thank you for every phone call to make sure the cyclist down wasn’t me. Thank you for showing your love even when it’s difficult. The year 2017 was a bad year for me. There was not much for me to write about. I did not do much riding due to an illness. The medication I was on had severe side effects that led me to gain considerable weight. This brings me to 2018. I have been riding more, not as much as prior years, like 2016, but more than 2017. I am also going to a gym and working on losing the weight I gained and getting back to good riding form. It Has Been Awhile but, I’m Back! In the Fall of 2017 I found acupuncture and other treatments that have helped a lot, and I got off the horrible medication. For 2018, I have revised my goals to be more realistic. I also plan to ride at least once each month during the winter, with a minimum ride of 20 miles or more. As for special rides, I hope to do the Alzheimers Ride of about 60 miles, RAID Rockingham, D2R2 and maybe the Seacoast Century Again. I will keep you informed. A.J. This past February I got a gift. It was for the seven day Cycle Mass Tour. Included in my gift was a Comfy Camper package which include, a single tent, air mattress, camp chair, fresh towels daily and the tent was set up and taken down during the tour by Comfy Campers personnel. The tour started on July 30, 2016 and ended on August 5, 2016. When I told a riding buddy that I was doing this ride, he looked at me and said good luck. He further stated he did the tour a few years earlier and thought that the tour went out of its way to find the worst roads to ride on. I can partially agree on that statement, because there were a couple of days where the roads were crappy. On the afternoon of Friday July 29, I arrived at Nichols College. I picked up my registration packet and went over to Comfy Campers to find my tent and home for the next three nights. I was on my own for dinner. After returning, I read a little until it became too dark to read. I settled in for the night which was a very hot sleeping night. There was a church nearby and I heard it ring its bell every hour on the hour. On Saturday at 6:30 a.m. the music started. One song that was played over and over through the tour every morning was “Istanbul/Constantinople”. I put on my kit and made my way to breakfast. After breakfast there was a riders meeting (there were riders meetings everyday usually after dinner). I along with two other riders I knew headed out on our own for the 62 mile ride. Saturday was hot but most of the ride was on shady roads with nice scenery. I thought it was a little too far for the first rest stop at approximately 25 miles but it was well stocked. The second rest stop was around 50 miles, but we decided to stop at a mini-mart/gas station and get some water and gatorade. We were about 8 or 9 miles from the next rest stop. I am glad we stopped because it was a very hot day. We climbed on to the last rest stop of the day. After the rest stop we had 12 more miles and 1,200 feet of climbing. The roads weren’t that great, some were busy with no shoulders. We survived. Cycle Mass provided a nice dinner and live entertainment. That evening rain came. Sunday was day two. It rained during the night and was raining in the morning. At breakfast I tried to get a feel of who was doing what. Some people were going to wait until the rain had passed and do the real short ride. I decided to rid the moderate ride with someone I knew from my club. It was raining but I had a rain jacket and a cover for my helmet. Near the end of the ride the jacket and cover came off. I decided that northeast Connecticut was fairly scenic, especially down around Woodstock. After the ride, I showered, socialized with some beer and went to dinner. Back at the tent I got everything organized for the next day and packed my bags for the move for our next overnight stop. On Monday it was off to Suffield, CT, just west of Enfield and east and slightly north of Bradley International Airport. The majority of the ride was scenic and uneventful with a couple of very steep rollers. The difficult and must screwed up part of the whole tour was the last part of this ride. We rode down past busy strip malls, center turn and right turn only lanes and lots of red lights. We were playing dodge-em. To add insult to injury, we had to deal riding through a four lane cloverleaf interchange with I-91. We then crossed the Conn. River on a multi-lane road and had to work to the left turn lane. Meanwhile, as I am enjoying the few of the Conn. River, I look and see a nice safe bike lane separated by traffic barriers. WTF! Our stay in Suffield was okay, but no great shakes. Dinner was good and we ate in a nice air conditioned school. The breakfast really left something to be desired. All I can say is thank goodness Comfy Campers had their great coffee as usual. The caterer for the non Comfy Campers did have enough coffee nor had it ready in time. Tuesday, off to Great Barrington. This was to be a killer day, hills and more hills. It rained overnight but was sunny when we departed. The ride was nice for a while. We also rode along a beautiful bike path, probably one of the best I have ridden. Then we turned on MA rt. 57. Rt. 57 was a steady climb until the first rest stop. The road had a lot of grit and sand along the side of the road. The road was still wet, so a lot of crap got attracted to drive-trains. From the rest stop at Granville, you could see the first of many walls that needed to be climbed, along with a road detail near the top of the first hill. These were brutal, after the first series you had a screaming downhill that plowed into a sharp left turn or a runaway truck ramp. This was in the town of New Boston, MA. After that it was a another steady climb to the next rest stop at Sandisfield, MA. After Sandisfield it was almost downhill all the way into Great Barrington, MA where we would spend two nights. Our host for Tuesday and Wednesday nights was the Berkshire South Regional Community Center. This was the best place of the whole trip. We were walking distance to restaurants (including a brew pub), and other amenities. The caterer we had for all our meals here was outstanding. Since we were out in the country there was not any light pollution, so the stars were very bright at night. It also got cold at night and I was thankful that I paid attention and packed warm pajamas and had a warm sleeping bag. This was contrary to the first night in Dudley, where it was so hot that I slept on top of my sleeping bag, wearing shorts and a t-shirt. Wednesday was a dilemma on which of the three rides to hit. Two went into New York state and one stayed in Massachusetts. An 80+ and a 60+ mile ride went into New York and hit some nice scenic spots of the Hudson Valley. The ride in Massachusetts was called the Alice’s Restaurant Ride, it was about 50 miles, give or take and I chose this ride. If you ever heard the song Alice’s Restaurant by Arlo Guthrie, this ride was named for it as it went past the Guthrie Center, which was the church referred to in the song and where the movie Alice’s Restaurant was filmed. There were other scenic highlights such as a covered bridge over the Housatonic River and historic markers documenting Shays’ Rebellion and the first official documented UFO sighting in the U.S. I was initially torn on which ride to take. I have never ridden my bike in New York, but the Alice’s Restaurant ride seemed more appealing. After the ride I got back took a nice shower, went over to the brew pub and met some other riders and had a nice time. Thursday, pack up and go. Another day of climbing heading east over the Berkshires. We followed route 183, and 23 over the Berks. The climbing wasn’t too strenuous. It was steady climbing to the first rest stop. The distance between the first and second rest was not that far; the majority of the climbing was behind us, but there was still some more climbing to go including one climb of just over 1/2 mile with a grade going between eight and thirteen percent. It was 86 degrees with building humidity, so there were more than a few people walking parts of this climb. Once over the top we had a sweet four mile downhill where speeds hit almost 40 mph before the next rest stop. This rest stop was a country store that was run by some Mennonites. The facility sparkled and the food and ice cream was great and the hospitality was even better. We had more downhill before the rest of the day’s ride turned sketchy. The sketchy part of Thursday began after the the downhill. Going through Westfield, MA was fine, it was a nice college town. We then hit West Springfield, dodging traffic on route 20. At least there was a farmer’s market to give us respite. Traffic got worse and the temperature was soaring as we crossed the Conn. River playing dodge’em cars on the route 5 rotary. Then down to the bike path, which do to construction dumped us onto a gravel railroad crossing of at least two tracks. (I wasn’t sure it was even a legal crossing.) We came out by the Springfield bus terminal and rode through downtown Springfield during very early afternoon. The sights and sounds of downtown Springfield included, metal plates in the road, weird smells from food trucks and some dude talking to himself while trying to hump a street light. After Springfield the roads eased out, I stopped for some Gatorade and got behind some guy buying 20 different scratch tickets. Then it was on to Wilbraham, MA, home of Friendly Ice Cream. I got there it was 90 degrees, our tents were out in the middle of a high school track. But there were shade tents and ice cold beer available. Dinner was great that night. Friday, the last day. The hills of Worcester County beckon, also that last four miles of climbing back up to Nichols College in Dudley. There were a couple of hard climbs, but beautiful riding through a lakeside town. Finally, I arrived in Dudley sometime between 12 and 1 pm. The ride and experience was over. I gathered my stuff, said goodbyes and thought about a suggestion from a friend that I should consider volunteering for this next year. I will have to see. Unless you lived in a cave these past six months, you know that New England got hammered with record snowfall. My only saving sanity was the fact I signed up for some Compu-trainer spinning workouts. It wasn’t until April that I finally got my first ride in. I only managed one ride in April but in May and June I managed to get the number of rides up to nineteen. I started out doing lower mileage rides of around 25 to 30 miles. Now I am up to about 35 to 42 mile range and hopefully by the end of June get a ride close to 50 miles. I have even managed to ride up Green Street Hill four times so far this year. This is different from last year when I hit the big mileage early and ended up with back spasm and a one week migraine that landed me in the hospital for three days. Other things that have changed is that RideWithGPS.com has asked me to be an ambassador and post some rides that other people can use. I really like using RideWithGPS.com and I encourage you to check it out. First off, I finished the year with 2,055 miles and 3 metric centuries. I was hoping for six metrics and at least one full century. Life and health got in the way. A week-long migraine which included a couple of days in the hospital. This caused me to miss two of my metrics and through my training in a tailspin which may have led to my demise on the D2R2. The year started out pretty good. A new road bike and some pleasant early January riding looked promising. Then winter came and we got hammered with very few decent days to ride until almost the end of April. I had an early goal to Ride for MS Cape Cod Getaway. So I trained often, early and probably too hard. This probably led to some amplification of some health issues. I was suffering from back and neck spasms after long rides which led to bad headaches. At first I thought I was not hydrating enough. I hydrated more which helped the headaches but I still suffered the back pain. I was almost resigned to back suffering and taking muscle relaxant pills before and after a ride. November rolls around and I find myself in a Computrainer Spin Class. The guys at the shop running the class suggested a chiropractor and gave me a few names. I looked up the names and they were all covered by my insurance. I picked one convenient to me and it has made it difference. I went for my only ride in December, which was over 23 miles in below freezing temperature, when I finished my back felt better than it had in a long time. So I will continue the chiropractor. For 2015, I hope to get out in January, maybe even January 1, and continue the Computrainer and get back in shape. I want to work hard over the winter so I can get reach 4,110 miles and three full centuries. October is a transitional month. You go from the warm summer temperatures that still tease you in September, to the cooler raw temperatures that remind you that winter will soon be here. During this month you are treated to the artist’s pallet of fall colors that dot the landscape. 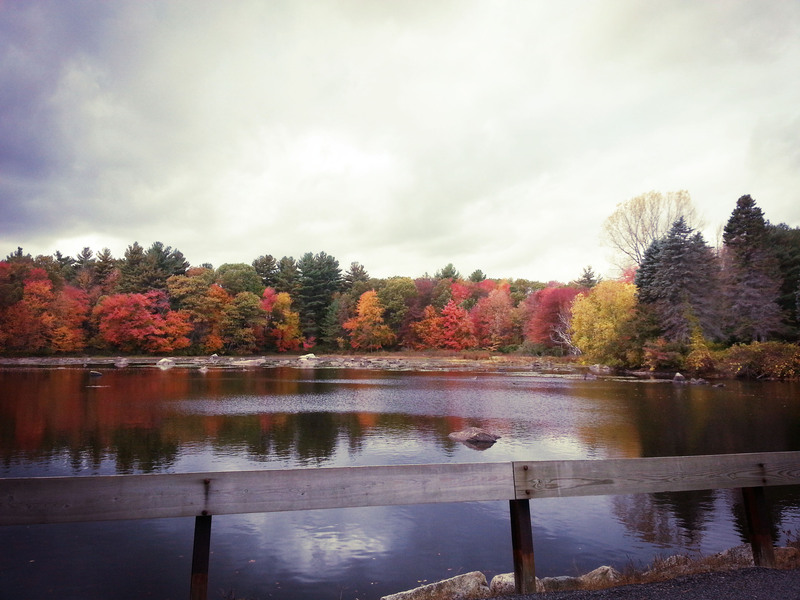 Riding in New England in Autumn is beautiful. The hills don’t seem as bad when you are treated with a gorgeous view around the next curve. I had the pleasure of leading a ride again this month. I will probably lead the same ride in November, weather permitting. It is the Ride to Redemption. There is a short and long version of the ride. The latest version will be the final one, depending on road construction. I had lots of compliments on the ride. I will tell you that leading a ride for a club takes a lot of work. You have to map out different routes, ride them to determine what the traffic will be like and make any necessary adjustments and then mark/arrow the routes. After this you have to print up the cue sheets and compare them to the maps. Finally you have to print up the waivers. It was work, but it was rewarding. The only issue that was brought to my attention was that one rider was wearing ear buds while riding. In Massachusetts, a bicycle is considered a moving vehicle and ear buds are not permitted while operating a moving vehicle. Anyway that’s it for this month. I hope everyone had a good month, I know my mileage was up over September. I also hope everyone had a Happy Halloween. Eating season has begun, so try to ride more and if you can’t ride, hit the gym or a spin class.